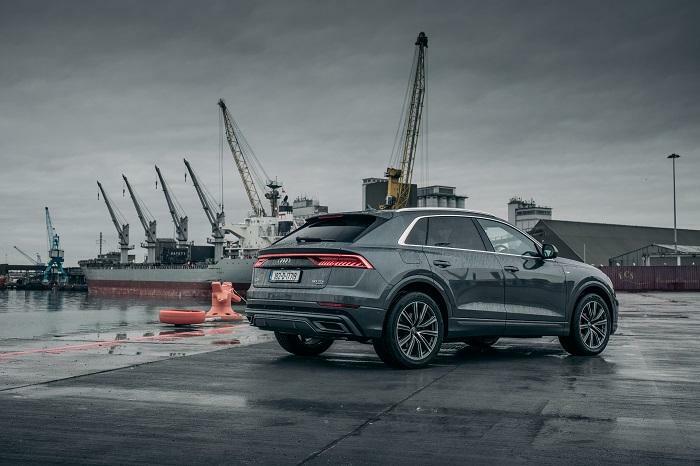 Move over Q7, there is a new big, bold and vivacious model in Audi's growing SUV stable. This is the Q8, a four door, five seat premium SUV that goes up against the BMX X6, Mercedes-Benz GLE Coupe and Range Rover Sport. 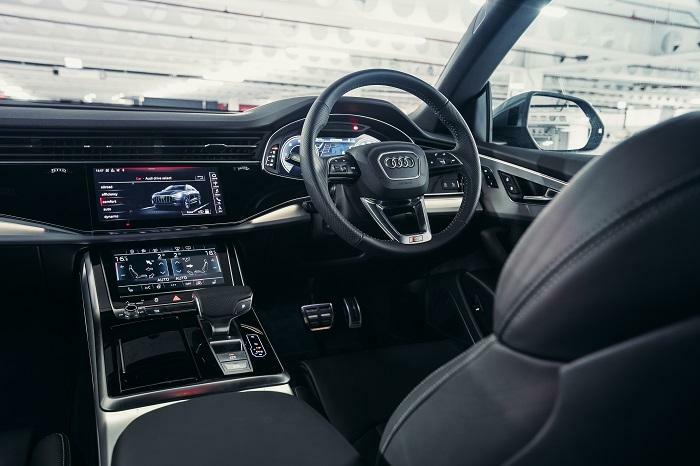 Just like Audi’s flagship A8 saloon, the Q8 showcases the latest and greatest technology that Vorsprung Durch Technik has to offer, with a digital-rich cabin, mild-hybrid powertrains and a suite of clever safety aids. We spent time with the Q8 on Irish roads recently to see what it is like to live with, and how it compares to the best in the premium class. Visually striking from any angle, the Q8 turns heads in a way that few other SUVs can. 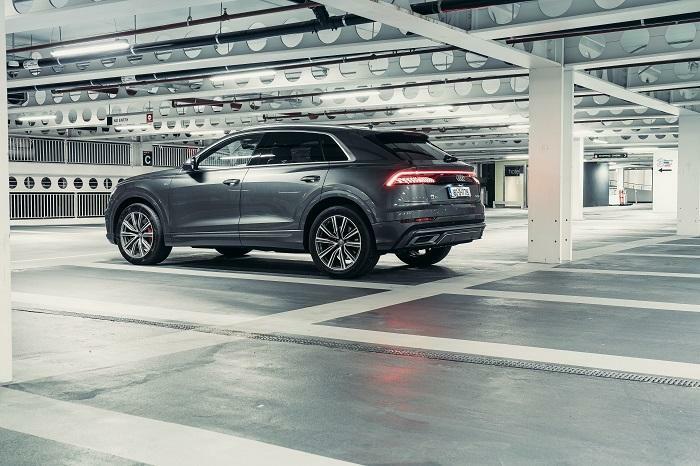 The Q8 is more aggressively styled than its stablemate, the Q7, with a towering front grille, swooping side lines, vibrant LED lights which run the entire length of the rear and an arching coupe-style roof. As standard, the Q8 wears 21-inch five spoke alloy wheels and Matrix LED headlights, while the adaptive suspension system alters the ride height with a simple touch of a button. Our test car is a high specification S-Line model and boasts optional extras to the tune of €26k, including a full panoramic sunroof and red brake callipers. The Q8’s cabin is cavernous with lots of interesting technology on display up front. The dashboard is dressed with a trio of vibrant digital screens, piano black inlays and moody ambient lighting. Most of the Q8’s functions are controlled via the touch screen displays and while the system is a little intimidating to use at first, it quickly becomes intuitive. The Q8 offers enough room to ferry five adults in absolute comfort and acres of boot space for their luggage too (605 litres), while the rear seats split and fold flat for loading larger items. That said, the Q8 isn’t as outright roomy or practical as the Audi Q7, and it doesn’t come with the option of seven seats either. At the heart of our test car is Audi’s powerful 50 TDI diesel engine, a 3.0-litre turbocharged six-cylinder unit that churns out 286 horsepower and 600 Nm of torque. All Q8’s feature Audi’s trademark Quattro all-wheel-drive and an eight-speed auto transmission, which makes for impressive performance out on the road. The 50 TDI-powered Q8 can sprint from 0-100km/h in just 6.3 seconds, which is quite impressive for a car of the Q8's size. The 50 TDI is exceptionally refined too, with a hushed six-cylinder engine note and smooth power delivery at all times. In similar style to Audi’s latest A6 and A8 models, the Q8 features a 48-volt mild-hybrid system which allows it to temporarily cruise on battery power, smooth stop start functionality and increased economy. During drives from Dublin to Galway and back, we achieved circa 8l/100km in fuel economy in our test car (35mpg in old money) while motor tax is rated at €750 per annum. The Q8 is a seriously comfy cruiser with minimal cabin noise and better agility in the corners than we expected. 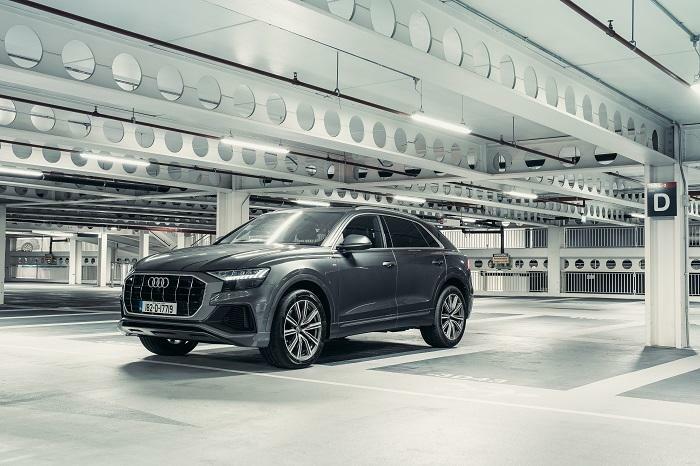 Although it isn’t as exciting to drive as some sportier SUVs like the Porsche Cayenne, the Q8 is nimbler than its size would suggest, with adaptive air suspension and a range of different driving modes available via the touch screen infotainment system. This includes ‘Comfort’ and a sporty ‘Dynamic’ mode which lowers the suspension by 40mm and sharpens power delivery accordingly. Audi’s Quattro all-wheel-drive offers lots of reassurance on tight and twisty roads and it feels planted all the while. Our test car even has optional All-wheel-steering for extra agility in the corners. The Q8 is a big car, though the standard front and rear parking sensors and parking camera do help when navigating shopping centre car parks. It’s equipped with lots of Audi’s latest safety tech too, including Pre-sense city systems and Active Lane Assist amongst others. Entry prices for the Q8 start from a whopping €103,520 which puts it in similar territory to the BMW X6. You get a lot of bang for your buck though, with an enviable list of standard features including 21-inch alloy wheels, deluxe air conditioning, Audi’s connect system with a three-year subscription, Audi virtual cockpit, electric front sports seats, an electric boot lid, Matrix LED lights, Valcona leather upholstery and electric sun blinds. Our test car is fitted with optional extras to the tune of €24,444, including a 360-degree camera system, adaptive windscreen wipers, all-wheel steering, an upgraded Bang & Olufsen sound system, heads-up display, heated windscreen, LED ambient lighting, panoramic sunroof, power assisted door closing and Audi’s Tour park amongst many others. 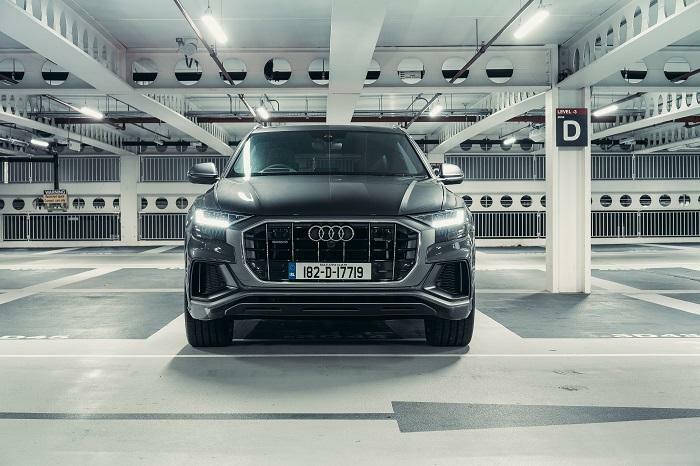 The Q8 claims top spot in Audi’s premium SUV pile and deservedly so, as it’s beautifully constructed inside and out, with attention-grabbing looks, cabin technology to impress and droves of passenger space and comfort. It isn’t as playful to drive as we would have hoped though, and it proves eye-wateringly expensive when the options list is ticked. That said, Audi’s new range-topping SUV delivers no shortage of style and sophistication out on the road.